You’ve heard these types of people – or even worse, perhaps you are one yourself. They blast newcomers to their favorite sports team’s fan base, proclaiming the only legitimate fans are ones whose outfit home from the hospital after birth was a team jersey. If you became a fan at any point when the team was having mild success, you merely jumped on the bandwagon and deserve to be thrown off immediately. Furthermore, if you are accused of being a bandwagon fan, your opinion on your team has no value. Sound familiar? Urban Dictionary defines these types of fans as “anyone who claims they are a ‘fan’ of a particular sports team, even though they had no prior support for/interest in the team until that team started winning” (not to be confused with “fair-weather fans” who ditch their team as soon as they start losing). My question to people who hate bandwagoners: why is your path to becoming a fan of a team more valid than another person’s? We all know you didn’t come out of the womb screaming “El Heat!” And even though you had a Red Sox-themed 1st Birthday party, we are well aware that you did not pick out the decorations. So stop trying to convince everyone that there was never a “beginning” to your personal adoration of a team and that you were just born with it. Everyone’s fandom starts somewhere, and there is no one “right” way to become a fan. People become fans of sports because of different motivators. Maybe they enjoy the beauty of the game or the stories of triumph. Maybe its a personal escape or maybe they got into it because a loved one dragged them along. Maybe it’s just an excuse to have friends over and socialize. Whatever your reasoning behind becoming a fan, there is no wrong way to do it. Growing up in Ocala, I was merely a social fan of Gator football until the 2006 National Championship. My family held a party at our house for the game, and I joined to cheer on the Gators because it was what everyone else was doing. However, when I watched that game, I was drawn in by the drama and my desire for more knowledge of how the game worked grew. I saw the achievement others felt when their team won and I wanted it myself. After that season, I started getting more interested in Gator football and following it more closely. My interest in the sport evolved from being purely social to now attending school here and being a vested fan. I think when motives are in place, one’s fan type grows stronger. I’ve also been on the other side of the picture. 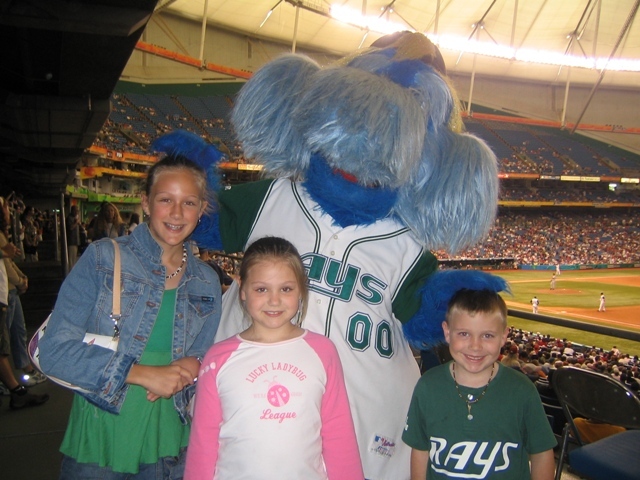 I’ve been a Tampa Bay Rays fan since childhood (pictured in the Devil Rays photo above). My family happened to have season tickets for the magical 2008 season, and I cheered my team on just as hard when they were the Rays as when they were the Devil Rays. That season & the World Series appearance prompted many new fans to jump on board with the Rays. Was I offended because they weren’t there for the Devil Rays years? Of course not! I welcomed the new fans we got (if you know anything about Tampa Bay, they could still use a few more fans anyways…). It gives me joy to see people sharing in the excitement I get from watching my team. The more the merrier! Winning happens to be a great catalyst to get fan motives moving, so naturally more fans will jump in. Just give them time; they will evolve. The “fair-weather” fans will eventually be weeded out, but many of the “bandwagoners” will develop a true interest and go on to become die-hards just like you. Fandom is not an exclusive club. “Lifelong” fans have no monopoly over the fan base and no right to claim whose fandom is valid. And if someone only wants to simply be a social fan, what’s wrong with that? I say, all aboard the bandwagon! It’s going to be a fun ride.